Think of chakras as your own little personal orchestra. Chakras are the speakers, & the aura is the music is coming out, your song flowing & broadcasting into the world. Chakras work best when in harmony, if one is out of tune or has some stuck energy, you may feel a little bit off. If you have been out of tune for some time, you may be used to that feeling & not realise that you are out of alignment. Find out where you’re chakras are stuck & how to communicate with other people & connect with them in a fun & balanced way. When you are in harmony you have personal presence, your energy radiates out strongly, you have positive, or at worst, neutral emotional responses to life events & live in a flow of synchronicity. 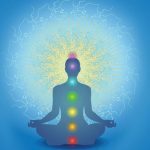 We work with your 11 Chakras (includes main 7 Chakras that run from top of head, down to the base of the spine) plus your Astral & Minor Chakras, your ARCM’s (auto response control mechanisms) & Cording etc. Energy work starts from the bottom of your spine, running up through each of the Chakras. When our Energy is out of balance one or more of the Chakras are out of tune or experiencing blocked energy. Keeping it simple, this means your Chakra(s) are spinning too slow, too fast or not at all for various reasons. Bring new results by breaking patterns, creating new energy events different from usual old recurring events. Restores your natural harmony & balance, chakras affect your physical body & organs. Brings synchronicity flow through coherence. If you are vibrating with coherency then everything around you will start healing you, as well as yourself. Removes the pull & push cords to others, that you usually unconsciously (sometimes consciously) develop. Cords are mostly unintentional. Balancing the connection & disconnection mode, bringing sovereignty, self confidence & self sufficiency. Shifting patterns of loneliness, insecurity, desperation, seeker behaviour, over sharing, over vigilance, & also of isolation, aloofness, needing too much space or not enough & list goes on. Money, relationships, health, love, sleep, trust, personal power, self-esteem, mood improvement, forgiveness, family relationships, enlightenment, discovering life purpose, vitality & on the list goes. These behaviours above & more, may easily shift upon chakra balancing.